A personal reminiscence by Professor T.S.C. Lowe, who introduced and made balloon observations on the Peninsula for the Union Army. Captain John Randolph Bryan, aide-de-camp to General J.B. Magruder, then commanding the Army of the Paninsula near Yorktown, Virginia, made three balloon trips in all above the wonderful panorama of the Chesapeake Bay, the York and the James Rivers, Old Point Comfort and Hampton, the fleets lying in both the York and the James, and the two opposing armies facing each other across the Paninsula. General Johnston complimented him upon the detailed information which he accured in this fashion, braving the shells and shrapnel of the Union batteries, and his fellow-soldiers nicknamed the young aeronaut "Balloon Bryan." On his final trip, made just before Williamsburg, May 5, 1862, the rope which held him to the earth entangled a soldier. It was cut. The Balloon bounded two miles into the air. First it drifted out over Union lines, then was blown back toward the Confederate lines near Yorktown. The Confederates, seeing it coming from that direction, promptly opened fire. Finally it skimmed the surface of the York River, its guide-rope splashing in the water, and landed in an orchard. On this trip the balloon made a half-moon circuit of about fifteen miles, about four miles of which was over the York River. The information which Captian Bryan was able to give General Johnston as to the roads upon which the Federals were moving enabled him to prepare for an attack the following morning. It was through the midnight observations with one of my war-balloons that I was enabled to discover that the fortifications at Yorktown were being evacuated, and at my request General Heintzelman made a trip with me that he might confirm the truth of my discovery. The entire great fortress was ablaze with bonfires, and the greatest activity prevailed, which was not visible except from the balloon. At first the general was puzzled on seeing more wagons entering the forts than were going out, but when I called his attention yo the fact that the ingoing wagons were light and moved rapidly (the wheels being visible as they passed each camp-fire),while the outgoing wagons were heavily loaded and moved slowly, there was no longer any doubt as to the object of the Confederates. General Heintzelman then accompanied me to General McClellan's headquarters for a consultation, while I, with orderlies, aroused other quietly sleeping corps commanders in time to put our whole army in motion in the very early hours of the morning, so that we were enabled to overtake the Confederate army at Williamsburg, an easy day's march beyond Yorktown on the road to Richmond. Firing the day before had started early in the morning and continued until dark, every gun in the fortification being turned on the balloon, and then the next morning they were still pointing upward in the hope of preventing us in some way from further annoying the Confederates by watching their movements. 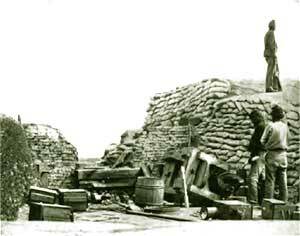 The last shot, fired after dark, came into General Heintzelman's camp and completely destroyed his telegraph tent and intruments, the operator having just gone out to deliver a despatch. The general and I were sitting together, discussing the probable reason for the unusual effort to destroy the balloon, when we were both covered with what appeared to be tons of earth, which a great 12-inch shell had thrown up. Fortunately, it did not explode. I suggested that the next morning we should move the balloon so as to draw the foe's fire in another direction, but the general said that he could stand it if I could. Besides, he would like to have me near by, as he enjoyed going up occasionally himself. He told me that, while I saw a grand spectacle by watching the discharge of all those great guns that were paying their entire compliments to a single man, it was nothing as compared with the sight I would look down upon the next day when our great mortor batteries would open their siege-guns on the fortifications, which General McClellan expected to do. I could see readily that I could be of no service at Williamsburg, both armies being hidden in a great forest. Therefore, General McClellan at the close of the battle sent orders to me to proceed with my outfit, including all the balloons, gas-generators, the balloon-inflating boat, gunboat, and tug up the Pamunkey River, until I reached White House and the bridge crossing the historic river, and join the army which would be there as soon as myself. This I did, starting early the next morning, passing by the great cotton-bale fortifications on the Tork River, and soon into the little winding but easily navigated stream of the Pamunkey. Every now and then I would let the balloon go up to view the surrounding country, and over the bridge beyond the Pamunkey River valley, I saw the rear of the retreating Confederates, which showed me that our army had not gotten along as fast as it was expected, and I could occasionally see a few scouts on horseback on the hills beyond. I saw my helpless condition without my gunboat, the Coeur de Lion, which had served me for the past year so well on the Potomac, Chesapeake, and York, and which I had sent to Commodore Wilkes to aid him in the bombardment of Fort Darling, on the James River, thinking I would have no further use for it. Therefore, all I had was the balloon-boat and the steam-tug and one hundred and fifty men with muskets, a large number of wagons and gas-generators for three independent balloon outfits. My balloon-boat was almost a facsimile of our first little Monitor and about its size, and with the flag which I kept at the stern it had the appearance of an armed craft, which I think is all that saved me and my command, for the Monitor was what the Confederates dreaded at that time more than anything else. After General Sherman had left me at White House, I soon had a gas-generating apparatus beside a little pool of water, and from it extracted hydrogen enough in an hour to take both the general amd myself to an altitude that enabled us to look into the windows of the city of Richmond and view its surroundings, and we saw what was left of the troops that had left Yorktown encamped about the city. Professor T.S.C. Lowe appears above standing by his father in camp before the battle of Fair Oaks, explaining by means of an engineers' map the service he proposed to render the Union army. Next to this, on the right, is the balloon from which General George Stoneman, McClellan's cavalry leader on the Peninsula, and Professor Lowe were able to look into the windows of Richmond. 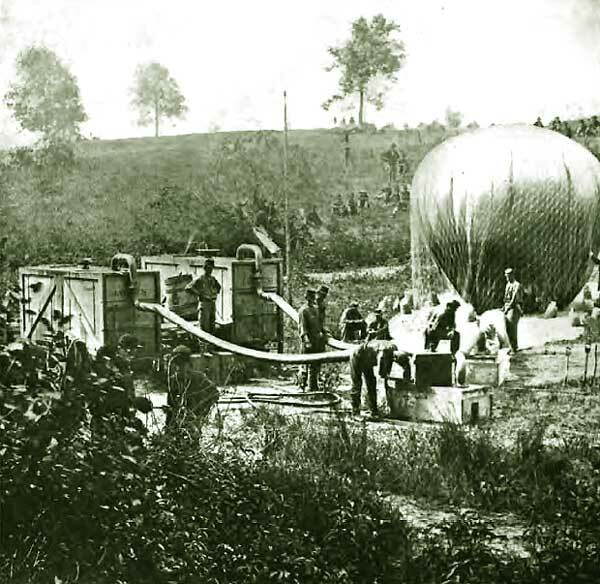 In this balloon also Professor Lowe was telegraphing, reporting, and sketching during the battle of May 31-June 1st, and it was from his night observations at this time that came knowledge on which McClellan acted in saving his army. On arriving in sight of Richmond, Lowe took observations to ascertain the best location for crossing the Chickahominy River and sketched the place where the "Grapevine" or Sumner Bridge was afterward built across that stream. His main station and personal camp lay on Gaines' Hill, four miles from Mechanicsville, overlooking the bridge where the army was to cross. 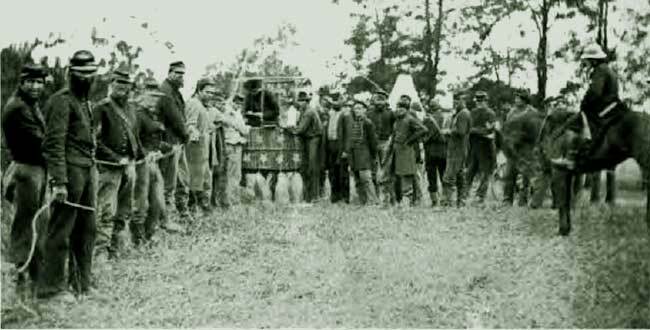 Desperate efforts were made by the Confederates at Mechanicsville to destroy the observation balloon in order to conceal their movements. At one point they masked twelve of their best rifled cannon; while Professor Lowe was taking an early morning observation, the whole twelve guns were simultaneously discharged at short range, some of the shells passing through the rigging of the balloon and nearly all bursting not more than two hundred feet beyond it. Professor Lowe immediately changed his base of operations, and escaped the imminent danger. While my illness at Malvern Hill prevented me from reporting to headquarters until the army reached Antietam, those in charge of transportation in Washington took all my wagons and horses and left my command without transportation. Consequently I could render no service there, but the moment General McClellan saw me he expressed his regret that I had been so ill, and that he did have the benefit of my services; for if he had he could have gotten the proper information, he could have prevented a great amount of stores and artillery from recrossing the Potomac and thus depleted the Confederate army that much more. I explained to him why he had been deprived of my services, which did not surprise him, because he stated that everything had been done to annoy him, but that he must still perform his duty regardless of annoyances. When I asked him if I should accompany him across the river in pursuit of Lee, he replied that he would see that I had my supply trains immediately, but that the troops after so long a march were nearly all barefoot, and in no condition to proceed until they had been properly shod and clothed. 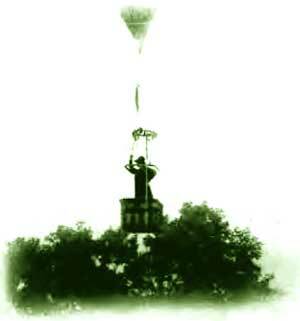 This is a photograph of a feat that would be noteworthy in the twentieth century, and in 1862, the lifting force of the balloon "Constitution" proved too weak to carry up the telegraph apparatus, its wires, and cables to a height sufficient to overlook the forests and hills. "I was at my wits end," writes professor Lowe, "as to how I could save an hour's time- the most precious and important hour of all my experience in the army. As I saw the two armies coming nearer and nearer together, there was no time to be lost. It flashed through my mind that if I could only get the gas which was in the smaller balloon 'Constitution' into the balloon 'Intrpid', which was then half filled, I would save an hour's time, and to us that hour's time would be worth a million dollars a minute." By the ingenious use of a 10-inch camp kettle with the bottom cut out, a connection was made and the gas in the "Constitution" was transferred to the "Intrepid". Without the time and knowledge gained by the midnight observations referred to at the beginning, there would have been no battle of Williamsburg, and McClellan would have lost the opportunity of gaining a victory, the importance of which has never been properly appreciated. The Confederates would have gotten away with all their stores and ammunition without injury. It was also my night observations that gave the prinary knowledge which saved the Federal army at the battle of Fair Oaks. On arriving in sight of Richmond, I took observations to ascertain the best location for crossing the Chickahominy River. The one selected was where the Grapevine, or Sumner Bridge was afterward built across that stream. Mechanicsville was the point nearest to Richmond, being only about four miles from the capital, but there we would have had to face the gathering army of the Confederacy, at the only point properly provided with trenches and earthworks. Here I established on of my aeronautic stations, where I could better estimate the increase of the confederate army and observe their various movements. My main station and personal camp was on Gains' Hill, overlooking the bridge where our army was to cross. When this bridge was completed, about half of our army crossed over on the Richmond side of the river, the remainder delaying for a while to protect our transportation supplies and railway facilities. In the mean time, the Confederate camp in and about Richmond grew larger every day. My night-and-day observations convinced me that with the great army then assembled in and about Richmond we were too late to gain a victory, which a short time before was within our grasp. In the mean time, desperate efforts were made by the Confederatesto destroy my balloon at Mechanicsville, in order to prevent my observing their movements. At one point they masked twelve of their best rifle-cannon, and while taking an early morning observation, all the twelve guns simultaneously discharged at short range, some of the shells passing through the rigging of the balloon and nearly all bursting not more than two hundred feet beyond me, showing that through spies they had gotten my base of oberations and range perfectly. I changed my base, and they never came so near destroying the balloon or capturing me after that. I felt that it was important to take thorough observations that very night at that point, which I did. The great camps about Richmond were ablaze with fires. I had then experience enough to know what this meant, that they were cooking rations preparatory to moving. I knew that this movement must be against that portion of the army then across the river. At daylight the next morning, May 31st, I took another observation, continuing the same until the sun lighted up the roads. The atmpsphere was perfectly clear. I knew exactly where to look for their line of march, and soon discovered one, then two, and then three columns of troops with artillery and ammunition wagons moving toward the position occupied by General Heintzelman's command. All this information was conveyed to the commanding general, who, on hearing my report that the force at both ends of the bridge was too slim to finish it that morning, immediately sent more men to work on it. As soon as Professor Lowe's balloon soars above the top of the trees the Confederate batteries will open upon him, and for the next few moments shells and bullets from the shrapnels will be bursting and whistling about his ears. Then he will pass out of the dangerzone to an altitude beyond the reach of the Confederate artillery. After the evacuation of Yorktown, May 4,1862, Professor Lowe,who had been making daily observations from his balloon, followed McClellan's divisions, which was to meet Longstreet the next day at Williamsburg. 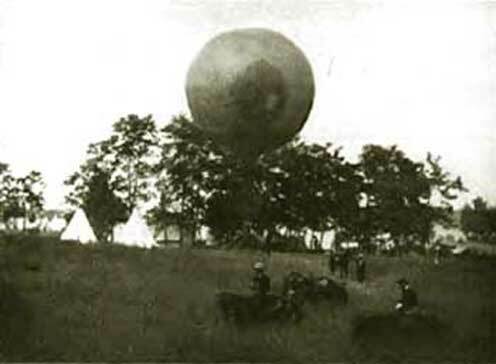 On reaching the fortifications of the abandoned city, Lowe directed the men who were towing the still inflated balloon in which he was riding to scale the corner of the fort nearest to his old camp, where the last gun had been fired the night before. This fort had devoted a great deal of effort attempting to damage the too inquisitive balloon, and a short time previously one of the best Confederate guns had burst, owing to over-charging and too great an elevation to reach the high altitude. The balloonist had witnessed the explosion and a number of gunners had been killed and wonded within his sight. His present visit was in order to touch and examine the pieces and bid farewell to what he then looked upon as a departed friend. 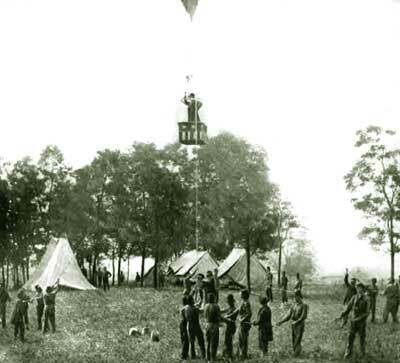 I used the balloon Washington at Mechanicsville for observations, until the Confederate army was within four or five miles of our lines. I then telegraphed my assistants to inflate the larger balloon, Intrepid, in case anything should happen to either of the two. 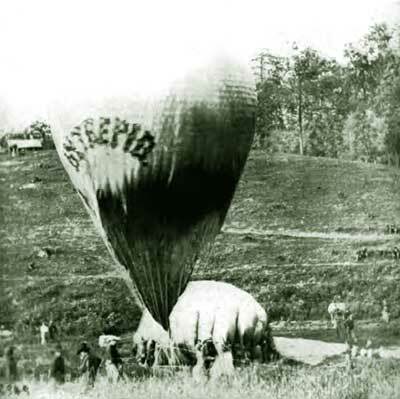 This order was quickly carried out, and I then took a six-mile ride on horseback to my camp on Gaines' Hill, and made another observation from the balloon Constitution. I found it necessary to double the altitude usually sufficient for observation in order to overlook forests and hills, and thus better to observe the movements of both our army and that of the Confederates. To carry my telegraph apparatus, wire, and cables to this higher elevation, the lifting force of the Constitution proved to be too weak. It was then that I put to my wits' end as to how I could best save an hour's time, which was the most important and precious hour of all my experience in the army. As I saw the two armies coming nearer and nearer together, there was no time to be lost. It flashed through my mind that if I could only get the gas that was in the snaller balloon,Constitution, into the Intrepid, which was then half filled, I would save an hour's time, and to us that hour's time would be worth a million dollars a minute. But how was I to rig up the proper connection between the balloons? To do this within the space of time necessary puzzled me until I glanced down and saw a 10-inch camp-kettle, which instantly gave me the key to the situation. I ordered the bottom cut out of the kettle, the Intrepid disconnected with the gas-generating apparatus, and the Constitution brought down the hill. In the course of five or six minutes connection was made between both balloons and the gas in the Constitution was transferred into the Intrepid. I immediateely took a high-altitude observation as rapidly as possible, wrote my most important despatch to the commanding general on my way down, and I dictated it to my expert telegraph operator. Then with the telegraph cable and instruments, I ascended to the height desired and remained there almost constantly during the battle, keeping the wires hot with information. The Confederate skirmish line soon came in contact with our outpost, and I saw their whole well-laid plan. They had massed the bulk of their artillery and troops, not only with the intention of cutting off our ammunition supplies, but of preventing the main portion of the army from crossing the bridge to join Heintzelman. As I reported the movements and maneuvers of the Confederates, I could see, in a very few moments, that our army was maneuvering to offset their plans. At about twelve o'clock, the whole lines of both armies were in deadly conflict. Ours not only held its line firmly, but repulsed the foe at all his weaker points. It was one of the greatest strains upon my nerves that I ever have experienced, to observe for many hours a fierce battle, while waiting for the bridge connecting the two armies to be completed. This fortunately was accomplished and our first reenforcements, under Sumner, were able to cross at four o'clock in the afternoon, folled by ammunition wagons. It may be of interest at the outset to relate an incident which illustrates the pinched condition of the Confederacy even as early as 1862. The Federals had been using balloons in examining our positions, and we watched with envious eyes their beautiful observations as they floated high up in the air, well out of range of our guns. While we were longing for the balloons that poverty denied us, a genius arose for the occasion and suggested that we send out and gather silk dresses in the Confederacy and make a balloon. It was sone, and we soon had a great patchwork ship of many varied hues which was ready for use in the Seven Days' campaign. We had no gas except in Richmond, and it was the custom to inflate the balloon there, tie it securely to an engine, and run it down the York River Railway to any point at which we desired to send it up. One day it was on a steamer down on the James River, when the tide went out and left the vessel and balloon high and dry on a bar. The Federals gathered it inm and with it the last silk dress in the Confederacy. This capture was the meanest trick of the war and one that I have never yet forgiven. "When I saw the photograph showing my inflation of the balloon 'Intrepid' to reconnoiter the battle of Fair Oaks," wrote Professor T.S.C. Lowe in the 'American review of Reviews' for February, 1911, "it surprised me very much indeed. Any one examining the picture will see my hand at the extreme right, resting on the network where I was measuring the amout of gas already in the balloon, preparatory to completing the inflation from gas in the smaller balloon in order that I might ascent to a greater height. This I did within a space of five minutes, saving a whole hour at the most vital point of the battle." A close examination of this photograph will reveal Professor Lowe's hand resting on the network of the balloon, although his body is not in the photograph (See: enlargement on left). It truly is remarkable that Professor Lowe should have seen and recognized, nearly half a century afterward, this photograph taken at one of the most critical moments of his life. 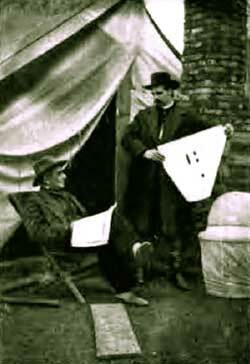 It was during the American Civil War that war information was first telegraphed fron the sky. This photograph shows Professor Lowe during the battle of Fair Oaks, completing a despatch just before ascending with telegraph apparatus and wire. "It was one of the greatest strains upon my neves that I have ever experienced," he writes in regard to this ascension, "to abserve for many hours an almost drawn battle, while the Union forces were waiting to complete the bridge to connect their separated army. This fortunately was accomplished, and our first troops under Sumner's command were able to cross at four o'clock in the afternoon, followed by wagons of ammunition for those who needed it. Earlier in the day many brigades and regiments had entirely exhausted their ammunition. Brave Heintzelman rode along the line giving orders for the men to shout in order to deceive the Confederates as to their real situation. When Sumner's troops swung into line, I could hear a real shout, which sounded entirely different from the former response."